Not to be confused with Level Flag. A Goal Pole (also known as a Flagpole or Goal Post) appears at the end of every normal level in most of the mainstream Mario games. Mario, Luigi, or any other playable character has to jump and grab the Goal Pole to finish the level. The flags on a flagpole come in many colors, though Red Flagpoles usually indicate an alternate exit in the New Super Mario Bros. games. Since then, if the player manages to grab the top of the flagpole, they will earn an extra life. Flagpoles were replaced with boxed, roulette-like goals in Super Mario Bros. 3, and Giant Gates in Super Mario World. These Flagpoles symbolize Mario and friends taking over or claiming that area — taking down Bowser's flag and/or replacing it with their own. In Super Mario Bros. and Super Mario Bros.: The Lost Levels, flagpoles feature a green pole and a white flag with a green skull on them, which is reversed in Super Mario All-Stars. Mario can jump over the flagpole in certain levels (such as World 3-3). In Super Mario Bros.: The Lost Levels, however, Luigi can easily do so due to his better jumping abilities. In order to still finish the level, he has to jump at it from the other side. It is unknown whether this is a glitch, as it does not cause any errors, and it was not fixed in Super Mario All-Stars (this also cannot be done in Super Mario Bros. Deluxe); Super Mario Bros.: The Lost Levels even hides a few Warp Zones behind them. If the player gets a 1, 3, or 6 on the timer in Super Mario Bros., they can get one, three, or six fireworks, each worth 500 points, depending on which number the last digit is. Grabbing the top of the flagpole in these games only rewards the player with 5000 points instead of an extra life. However, in Super Mario Bros.: The Lost Levels, the player can receive an extra life from a flagpole, but only if both digits of the coin counter and the last digit of the timer match when the player's character touches the flagpole. In Super Mario Advance 4, Flagpoles return, after 19 years of absence, in the remakes of Worlds 1-1, 1-2, 1-3, and 2-2 from Super Mario Bros. These flagpoles do not mark the end of the level, as the true Goal comes after the Flagpole; the player can still gain points (or an extra life from touching the very top). The area between the Flagpole and the true Goal is usually empty, however. The sprite for these flagpoles is reused from Super Mario All-Stars. Starting with New Super Mario Bros., the flagpole now has a black flag (with a clearer skull symbol on it) and yellow top (both are red for secret flagpoles), instead of green or white ones; it also now sits on a fortress-styled base, rather than a Hard Block. It works as it did in Super Mario Advance 4. Mega Mario or Mega Luigi can destroy the flagpole, awarding 8000 points for the destroyed flagpole and filling up one-fifth of the meter above them, ensuring at least one extra life is gained. They shrink into Super form and head into the fortress afterwards. Additionally, if the last two digits of the timer are same when the level is cleared, the "Level Clear" theme from Super Mario Bros. plays in place of the normal one, fireworks go off (1 for ending in 11, 2 for ending in 22, and so on, awarding 4,000 points per explosion, for a maximum of 36,000), and a bonus Toad House appears at the map's starting point. Time limits ending in 11, 22, or 33 yield a Power-Up Toad House, 44, 55, and 66 yield a 1-Up Toad House, and 77, 88, and 99 yield a Mega Mushroom Toad House. None of these houses are permanent, even after completing all of the levels in the game. Flagpoles reappear in New Super Mario Bros. Wii, where Bowser's emblem replaces the skull on the flag. Like in New Super Mario Bros., Toad Houses can appear at the starting points of worlds by using the same strategy. In multi-player mode, the strategy is exactly the same, but since there are no Mega Mushroom Toad Houses, Star Toad Houses appear when the time limit's last two digits show 77, 88, or 99, and the times for the Power-Up Toad House and 1-Up Mushroom Toad House are flipped. In single player mode, the strategy is slightly different. Instead of finishing the stage with the last two digits of the time limit being the same, if Mario or Luigi saves the Toad in the level and takes him to the end, only the last digit counts (e.g. 1, 2, and 3 make a 1-Up Toad House appear instead of 11, 22, and 33). Once again, these Toad Houses aren't permanent. Mario grabbing onto a Goal Pole in Super Mario 3D Land. The flagpoles, now called Goal Poles, appear in Super Mario 3D Land; their first appearance in a 3D Mario game. Unlike in 2D Mario games, Goal Poles appear in every level, even in castles and airships. After defeating the boss of an airship or castle, Mario has to keep walking to the Goal Pole instead of ending the level immediately after defeating the boss, as in previous games. When Mario grabs any part of a Goal Pole, he earns Coins rather than points, and a red flag with Mario's emblem (or a green flag with Luigi's emblem if playing as Luigi) replaces the one with Bowser's emblem (All three flags are giant in castles, airships, and Special 8- .). However, if Mario grabs the top of a Goal Pole, he will earn an extra life, and the flag will turn golden instead. These golden flags are required for 100% completion for the entire game. If Mario grabs the pole when the last digit on the timer is a 1, 3, or 6, streamers, fireworks, or balloons, will appear, respectively, as "COURSE CLEAR!" is displayed, similar to Super Mario Bros. Also, in World 2-3 and Special 1-3, the level clear theme from Super Mario Bros. is played instead of the normal one. In this game, New Super Mario Bros. 2, and Super Mario 3D World, instead of being pulled down, the Bowser flag is simply replaced by a Mario flag, which rises up to where Mario landed on the pole. In New Super Mario Bros. 2, getting double digits the same as the world number (i.e. the timer has to be x11 when in World 1) at the end of the timer means that a Rainbow Course will appear on the map. The Goal Pole can still be destroyed by Mega Mario or Luigi, but the player only gains three extra lives for doing so. If Mario is in his Gold form, he gains Coins upon grabbing the Goal Pole instead of points, like in Super Mario 3D Land. Additionally, hitting the top of the Goal Pole in Coin Rush mode doubles the round's accumulated coin total. Mario and Yoshi grabbing onto a Goal Pole in New Super Mario. Bros. U. In New Super Mario Bros. U, getting double digits at the end of the time (i.e. if a player finishes with a time left of 344, four fireworks go off and Toad will give them a Fire Flower as a reward) will give a reserve power-up (A Super Mushroom for x11, x22, or x33, Fire Flower for x44, Ice Flower for x55, Mini Mushroom for x66, Super Acorn for x77, or a Super Star for x88 or x99; nothing is given for x00.). In New Super Luigi U, when the player grabs the Goal Pole as Nabbit, they will receive 1-Up Mushrooms based on the amount of power-ups they collected. In certain Challenge Mode missions, the Goal Ring appears as the endpoint instead. Goal Poles return in Super Mario 3D World. They function the same as in Super Mario 3D Land. However, they once again give points in this game, and hitting the top of a Goal Pole gives the player 10,000 points instead of an extra life. Again, hitting the pole will make a flag with a character's color and emblem appear (red for Mario with the letter M, green for Luigi with the letter L, pink for Peach with her crown, blue for Toad with his face, turquoise for Rosalina with a Grand Star, or gold for hitting the top), depending on who reaches the highest on the pole first. If the timer ends in 1, 3, or 6, then fireworks will appear in addition to the "Course Clear" message (except for The Great Tower of Bowser Land), acting like they did in Super Mario Bros., though the firework points have changed from 500 to 1000. Fake Goal Poles can be found in Ghost Houses; touching these reveals that they are actually swarms of Boos, which promptly disappear. Winged Goal Poles appear in The Great Goal Pole and Back to Hands-On Hall. In the former, the Goal Pole appears at the beginning of the level and flies away when the player approaches it. In the latter, the Goal Pole can be seen flying back and forth at the end of the stage. In Super Mario Maker and Super Mario Maker for Nintendo 3DS, Goal Poles appear at the end of levels in the Super Mario Bros. and New Super Mario Bros. U styles. In the Super Mario Bros. 3 and Super Mario World styles, they are replaced with square goals and Giant Gates respectively, while in any given castle theme, they are replaced with an Axe. When designing a stage, the player is able to adjust the location of the Goal Pole with a slider at the bottom of the screen, making the level longer or shorter. Magikoopas are capable of temporarily removing the Goal Pole, forcing the player to defeat them to make it appear again. In Super Mario Run, Goal Poles appear in the first three levels of each world in World Tour. They do not appear in Toad Rally. They also appear in most courses in Remix 10 mode (except for underground courses, tower levels, inside ghost houses and boss levels). Upon touching the Goal Pole, the player earns up to ten coins (depending on their landing height), and Bowser's flag is replaced with a colored flag (red for Mario, green for Luigi, blue for Toad, pink for Peach and Toadette, and orange for the Yoshis and Daisy) with their respective emblem on it. Character-themed Goal Poles are also usable as decorations in Kingdom Builder mode. Goal Poles being used as the EXP meter in the Mario & Luigi series. Mario could jump on Flagpoles in Dance Dance Revolution: Mario Mix, in the Flagpole Leap minigame. They also appear in the Bowser intermissions in Paper Mario: The Thousand-Year Door; Bowser can knock the flagpole completely off screen if he is large enough, like Mega Mario. In Mario & Luigi: Superstar Saga, there is a flagpole in front of the Little Fungitown that can be slid down on in the Beanbean Kingdom. A flagpole is also seen in the Super Mario Bros. picture behind the Border Bros. As of Mario & Luigi: Bowser's Inside Story, when Mario, Luigi, Bowser (in Bowser's Inside Story), or Paper Mario (in Paper Jam) gain Experience Points, Goal Poles appear as the EXP meter; when the flag gets to the top of the pole, they level up. However, in Mario & Luigi: Bowser's Inside Story, Mario, Luigi, or Bowser do not have their flags. Instead, they have flags with mushroom emblems. These flags were changed back to their usual appearances as of Dream Team, and added to Superstar Saga's remake. In the Mario Party 8 minigame Crank to Rank, flagpoles with the Star Carnival emblem shown on them appear. In the opening cinematic of The Super Mario Bros. Super Show!, Mario, Luigi, Toad, and Princess Toadstool can be seen sliding down multi-colored Goal Poles. In the course Piranha Plant Slide in Mario Kart 7, several black and red Goal Poles can be seen on each side of the road just before the finish line. Goal Poles are also used in Mario Tennis Open, where they appear in the Super Mario Tennis mode. The Goal Pole can be hit by a tennis ball, and will end the mode in success, also offering a varying amount of coins dependent on how high the Goal Pole was struck, similar to Super Mario 3D Land. Goal Poles appear in the background of the Super Smash Bros. version of Mushroom Kingdom and the Super Smash Bros. Melee version of Mushroom Kingdom. One is also seen in Mushroomy Kingdom in Super Smash Bros. Brawl, Super Smash Bros. for Nintendo 3DS, and Super Smash Bros. Ultimate, in the same place that it was in World 1-1 of Super Mario Bros. However, it's in the background, so fighters cannot slide down it, the Hard Block that it stood on is missing from the stage (but only in Brawl and for 3DS; it is in the background in Ultimate), and the pole is completely removed in the 3DS game's Final Destination version. The flag is now worn out, and the Goal Pole in general is a withered realistic brown, to fit with the stage's ruined look. In Super Paper Mario, there is a Sammer Guy called "Over the Flagpole", a reference to the glitch of the same name from Super Mario Bros. and Super Mario Bros.: The Lost Levels. In Mini Mario & Friends: amiibo Challenge, a Goal Pole can be seen in Mini Mario's Boost Pad Bonanza section. In Paper Mario: Color Splash, Super Mario Bros.-styled Goal Poles are used to exit the Super Mario Bros. 3-themed area in the Green Energy Plant; a modern-styled version (though with the flag's original color scheme) also appears in Black Bowser's Castle. In Animal Crossing, Animal Crossing: Wild World, Animal Crossing: City Folk, and Animal Crossing: Pocket Camp, the Flagpole as it appears in Super Mario Bros. appears as a furniture item. In Animal Crossing: New Leaf, it uses its modern name and appearance, while in Animal Crossing: Pocket Camp, it is named "8-bit Goal Pole." In Nintendo Monopoly, there is a Coin Block/Brick Block card that rewards the player with $20 for hitting the top of a Flagpole. 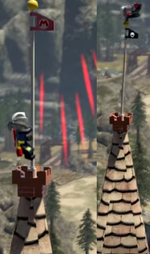 In Lego City Undercover, one of the flags on the castle is the Goal Pole. In the Japanese version of EarthBound, one of the default names for Ness' favorite thing is Goal. This coincides with several other default names in the game that make Ness' party members named after Mario characters. The sound effect that plays when Mario/Luigi slides down the Goal Pole in the New Super Mario Bros. series is the same as the one that plays in Super Mario Bros., but reversed. ↑ Tatsumi Yamashita, The Official Nintendo Player's Guide, Tokuma Shoten, 1987, ISBN 999832369X. Page 33. This page was last edited on March 18, 2019, at 01:09.